Sitting on his haunches, 64-year-old Satya Prakash Shukla carefully waits for the sound of a potential customer amidst the droning hubbub of Delhi's posh Khan Market. With a colourful spread of packed diyas in front of him, he moves his fingers deftly from one stack to another to pick out the products his visitors ask for, offering them the same with a smile. "It doesn't matter how many customers I get. God has provided for me and my wife all these years. Why should I worry about sales now?" the blind hawker said. "Online market has entirely killed our sales," Suraj Singh of Aastha Steel Centre in east Delhi's Mayur Vihar said. Singh, whose modest shop is lined with a wide array of kitchen utensils, hasn't had a very festive Dhanteras in the last few years. "Earlier we would get large pre-Diwali orders of 500-700 items like cookers, tiffin sets, but now nobody is looking for such big orders. They only buy one or two items like spoons, steel plates, or bowls," he said. On the other hand, leading e-commerce websites are looking forward to Diwali. Their market share has only strengthened over the years, they said. With a focus on the next "100 million buyers", Snapdeal, an India-based e-commerce website, told PTI that it has seen a 2.5-times increase in orders this year and 75 per cent of all orders were received from non-metro cities. "Till now e-commerce has been about relatively homogenous metro buyers, relatively high-income and voracious internet users. Now the market is rapidly expanding beyond the first 100 million e-commerce buyers. The socio-economic demographics are now spread over a wider spectrum," a Snapdeal spokesperson said. The most popular items purchased on the online shopping website during the 2018 Diwali sale were sarees, bedsheets, utensils, among other products. Besides the competition from online market, Mukesh Goyal of Kriti Creations blames the increasing prices of decorative and festive essentials for a dampened sale year after year. "The common man is troubled with increasing prices. Essential items like statues of deities are taxable, camphor, which is important for Diwali rituals, is selling with 18 per cent GST. Earlier we had to pay only 5 per cent VAT on it," he said. Goyal, who is the third generation owner of the year-round festival shopping store in Khan Market, added that owing to such increasing prices "people choose online retailers, who get foreign funding and can afford bigger discounts and offers". Despite a seemingly excited crowd thronging Goyal's shop, he said that the sales this year have not improved as the people "who used to buy statues worth Rs 21,000, are going away with those of Rs 1,100". "Nobody is placing large gift orders anymore" is a common sentiment resonating among local sellers like Singh and Goyal. "Earlier customers used to send orders for gift hampers, today nobody is interested in them. They are more into small decorative items only," Goyal said. However, major e-commerce website, Amazon India shared data indicating that the market wasn't as bad for the local sellers as it seemed. A large part of the inventories of the online shopping portals was being provided by offline retailers, it said. 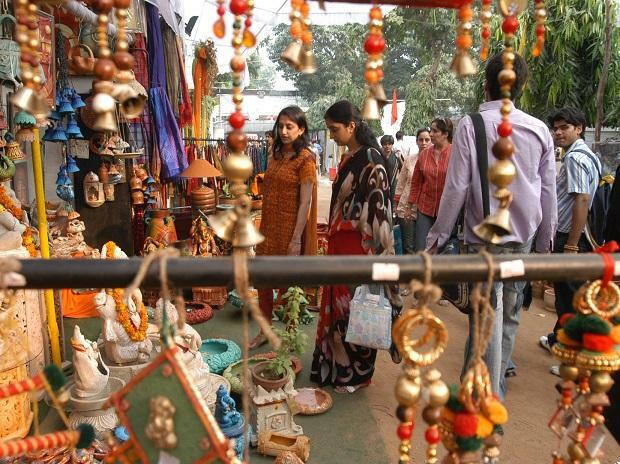 In its "Great Indian Festival" held between October 10-15, the e-commerce giant saw "new sellers growing by 300 per cent in sales over an average business day with 7,000 sellers crossing the millionaire mark". Snapdeal too believed in providing offline sellers with a "platform to start and grow their digital enterprises, even as they nurture their traditional, offline businesses.